It’s not on Best Buy’s website yet. How did you order it? I still question this opinion that you will see the pixels because I don’t at my 10.5ft from a 100” screen which is roughly the same distance to screen ratio you are using so I asked my sons to question do you see pixels and they said no, in fact they had to move to about 7ft before they thought there was a change in the structure but even then they thought it was properly sharp. I’ve seen asked the brother who has went through correctly laser eye surgery and his opinion was the same as the boys. The images where taken at 2.5m, 1.2m, 0.6m and the final one at a foot from the screen. Alaric and DavidK442 like this. Last edited by Luminated67; 04-16-2019 at 12:17 AM. The difference is in sharpness! 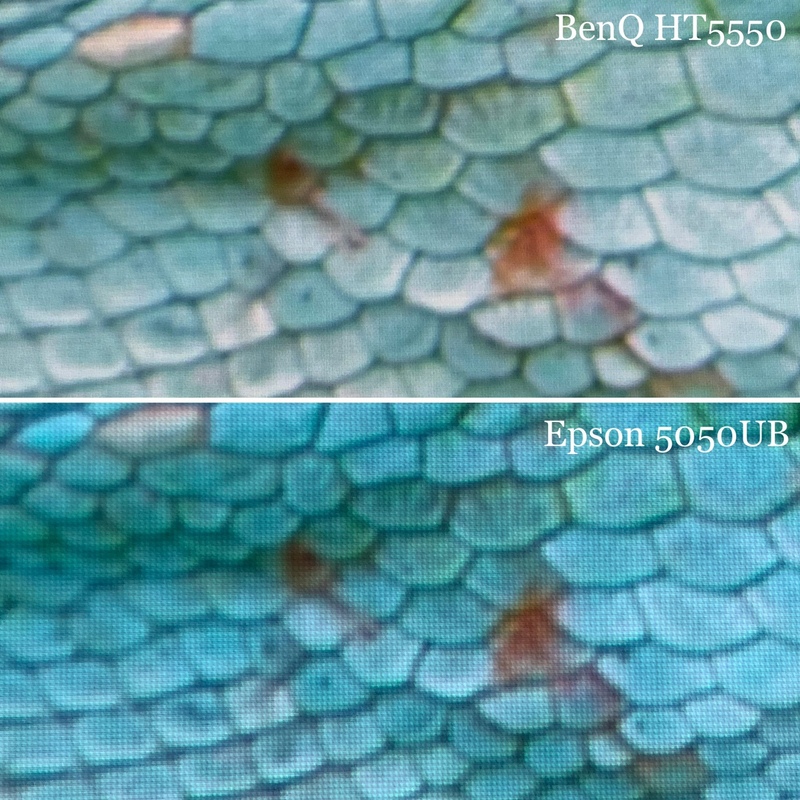 it seem DLP with a good lens is sharper than 3LCD thus appear (when side by side) to have more depth of details! but in a blind test in a 2 rooms I think it will be a hard time choosing which is more sharper (more details) and the eye will then prefer the brighter picture (which is in Epson favor) we really need a baby! I did the direct comparison with a Sony 270es (not sure the US equivalent) and from my viewing distance and screen size I couldn’t say I noticed much if any improvement in sharpness, it just looked a bit different if you know what I mean. The same is true when I bought my OLED the other week, the store had a new 8K TV playing a demo and beside it the same sized 4K, each picture looked identical. I agree, so I would have to plaster my face against the screen to see the extra detail and loose on the black levels, lens memory and placement flexibility on the Epson? that's a no brainer. MidnightWatcher, CallingMrBenzo and AVpassion7 like this. Do not steal, The powers that be do not like the competition. Talking about Lens Memory.. one needs to be using a 2.35:1 ratio screen to take advantage of it right? Ever since I purchased my Pioneer Kuro 5080 back in 2008, my eyes were opened wide. The 5080 may technically be only 768p, but I still prefer the PQ it provides to this day over many higher resolution LCD/LED HDTVs being sold in 2019. Because of the Kuro, blacks/contrast have become one of the most important qualities in PQ for me. 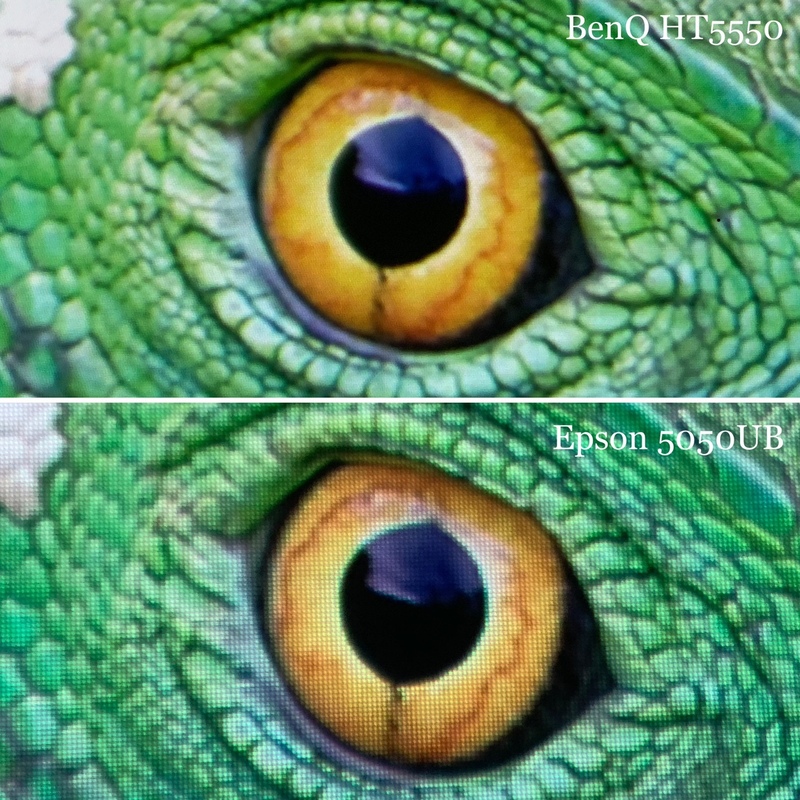 As detailed as the BenQ HT5550 looks in the photos above (and it does look great), I could personally never settle for anything less than the blacks and contrast offered by my (now ageing) Epson 5030UB. I'd feel like I were taking a step back. If and when DLP manages to obtain Epson-level blacks at the same price point, it'll be a much easier decision for many of us to make. CallingMrBenzo and jpolachak like this. Ha! We wouldn't want that. For some it will be a bigger deal than others. Considering the price difference, albeit only 20% of the total cost, some people may prioritize resolution close to, or even greater than black levels. Size of screen and seating distance will need to be considered. I'm not saying I can see individual pixels in a moving image at a 16' distance with a 160" screen... what I'm saying is the fine detail resolution seems fuzzy coming from an 8.3M pixel projector. It's hard to explain. My brain has gotten used the way the HT3550/HT5550 renders fine detail. If you ever get a chance to pick up and use an iPhone 3GS after using Retina displays sometime I think you'll know what I mean. At a normal viewing distance you won't notice individual pixels on the 3GS unless you put your nose to the screen. However, our brains have grown so accustomed to the Retina display since the iPhone 4, that you can easily see a resolution difference at normal viewing distance.... even at a distance you didn't think you could see individual pixels on the 3GS before. With displays, the increased resolution is rarely appreciated from the get-go. Rather, it is only when you have to back to the lower resolution display that you fully appreciate the increased resolution you have grown accustomed to. You feel dirty and kind of 'jipped' having to "cope" with the reduced resolution. Haha - first world problems! This is why so many people are going to be enthralled with the 5050UB - because very few will be coming from a true 4k display. And that's ok! I'm sure even some people moving from 4K displays that have acceptable screen size to seating distance ratios that will really appreciate the black levels, input lag, and brightness of the 5050UB. CallingMrBenzo and JonfromCB like this. Mostly, yes. I'm sure there are some fringe use cases for lens memory for a fixed 16:9 screen, but I haven't found that benefit yet. 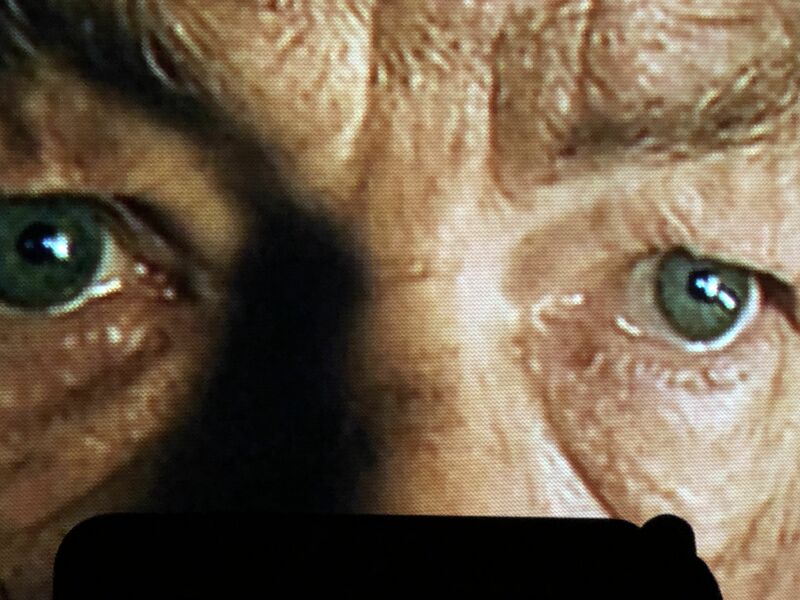 The only thing I can think of is using blanking on scope material, but from first hand experience, there is no difference in letterbox black levels with or without blanking. 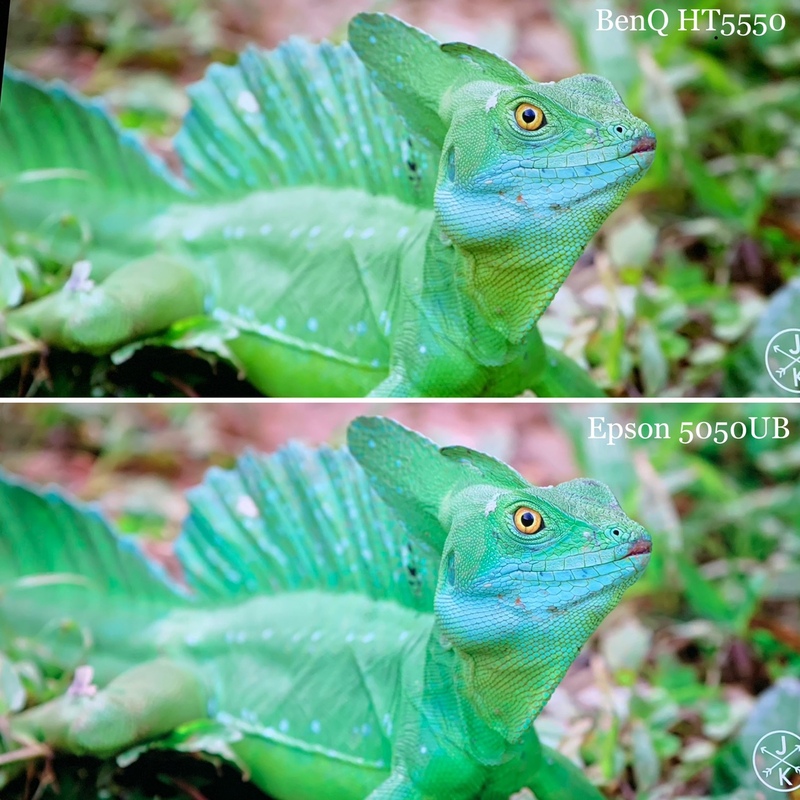 This is odd to me simply because I compared the Epson against Native 4K which no one can deny is superior to even True 4K as there’s no smudging the pixels as there is with the either e-shift system and I couldn’t see the improvement in sharpness you are mentioning here. Even in the two images of the full sized lizard you can’t see the improved sharpness simply because our eyes can’t focus this detailed. 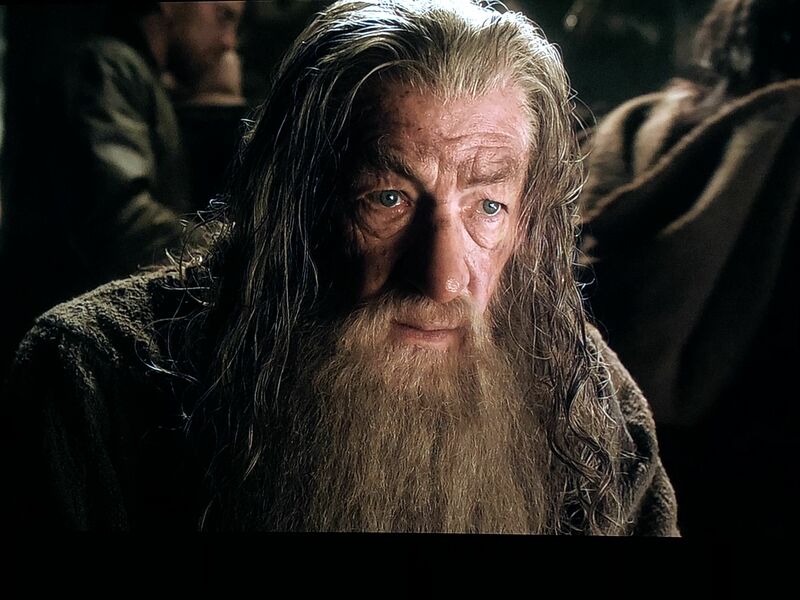 Look at the images I did of Gandalf, you can only truly notice the pixels at the 2 foot from the screen, the camera doesn’t lie. The only thing I can think of is using blanking on scope material, but from first hand experience, there is no difference in letterbox black levels with or without blanking. Very true, it’s one of the first things I did when I got the projector. My intention is to switch my current 100” 16:9 screen to a 115” 2.35:1 acoustic screen, only then will lens memory truly become a benefit. Any screen wider than 1.78:1 (16:9) would use it. There are folks using 2.0:1 screens (and other variations) out there in addition to scope. I don't disagree. Like I said, it's hard to explain. Text on screen (Xbox menu, navigating Shield TV) you can for sure tell a difference side by side in sharpness. Moving content. You're right, I don't think I would notice an appreciable difference in a single scene side by side even on my large screen. I think the kicker is that you have to have spent a significant amount of time with a true 4K unit to have your brain get used to how fine detail is rendered. Refer to my iPhone analogy above. FOR ME...there will be a scene where something just looks a off or fuzzy. In normal operation, yes as explained elsewhere. However on a wider shot film on my 16:9 screen i ocasionally shift the image up and have no black bar at the top and a big one at the bottom. You could do a simple one side moveable masking that way, but in my case it's better for back row watching, if we tilt the recliner right back, or feet / knees getting in the way. Essential, not at all but actually quite useful if you have it to play with! I’ve been debating this for a while now. I am going with an acoustic transparent screen. Ill probably buy a silver ticket again however do I go for a 110 /120 16:9 or do I go for 115 2:35:1 as they don’t seem to have any other size available. I get what you are saying but I was that person a while back where all I wanted was to turn on, watch a movie and that was it which was why I had the Sony HW45es but very quickly you get hooked into this and then you want more from your system which is why the Epson is quite unique at this price point for what’s on offer. What I do now when running a wider shot film on my 16:9 screen is to roll the screen up using the remote control so that the bottom black screen border lines up with the lower edge of the image area. Top black bar remains but the bottom is eliminated without making the viewer to look up (image remains at the eye level). My 16:9 screen is 120" and my room doesn't allow me to install any screen wider than that because of the 2 walls on the sides. This is why in my situation I was wondering whether I could take advantage of the lens memory feature and still feel I gained something extra ..
Alaric and Luminated67 like this. Different viewers have different levels of visual acuity. Print out a Snellen chart and stand 20 feet away. I would wager that scottyroo can make out the bottom line of characters, and that he has 20/20 vision. He might have vision that is superior to this. A small minority of people - usually very young - can score 20/15 or better. As people age, they usually experience a gradual decline in their ability to read the lowest lines of the chart, even with corrective lenses. 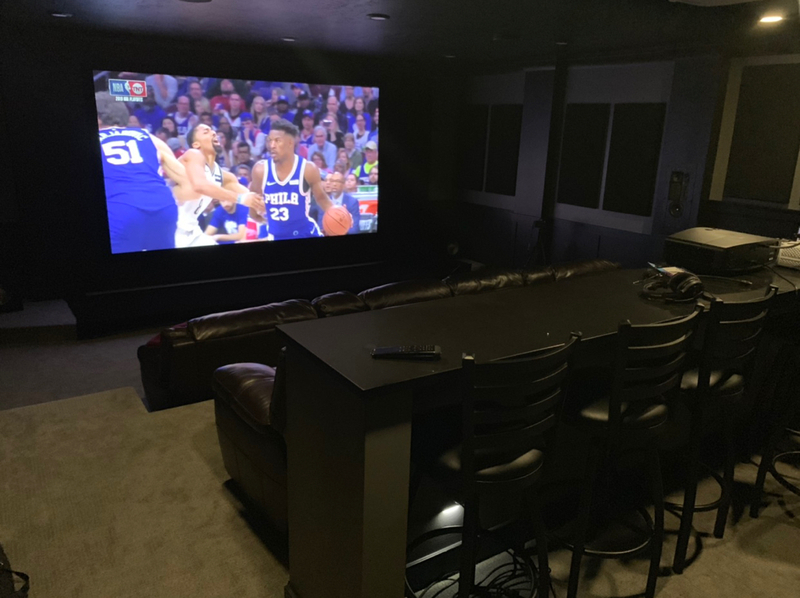 Moral of the story: for many of us - but not all of us - spending extra dollars on projectors with the very highest "true 4K" or "native 4K" resolution is flushing money down the toilet. The story changes with black levels and contrast. 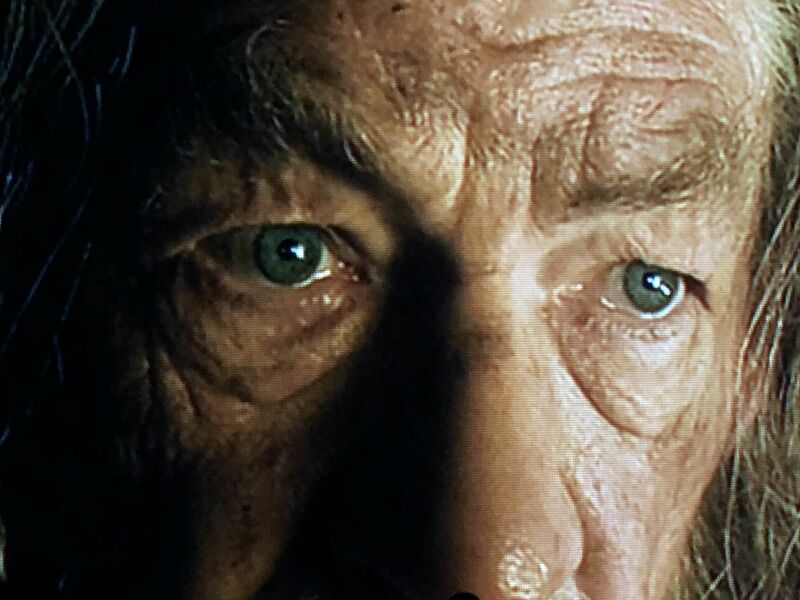 Here the vast majority of viewers have roughly equal ability to appreciate inkier blacks, at least when viewing the darker parts of movies in a light-controlled room. I am reminded of a line from an old Clint Eastwood film: "A man's got to know his own limitations." Alaric, termite and scottyroo like this. Last edited by joel dickman; 04-16-2019 at 01:20 PM. From what I read the concensus is if you want the sharpness and your room is light controlled then go for the ben Q, However, if what you need is brightness and you need flexibility in your installation then go with the epson. I have the epson 5050 and so far I am very happy with my purchase. My theater is in a common area and I like spectral highlights on my HDR movies therefore I chose the brightest projector. Like you I also want to watch a movie and forget about settings but I did tinker with its options out of the box which are abundant on what you can do. I settled for bright cinema on normal lamp for 4k movies with HDR slider at 8. For blurays however I am very pleased with cinema mode at normal lamp mode. I want to make further improvements down the road such as adding that panasonic player everyone is raving about but for now I am good. Movie watching is now better than going to the theater. I popped in several movies now and I have not looked back at the settings once. 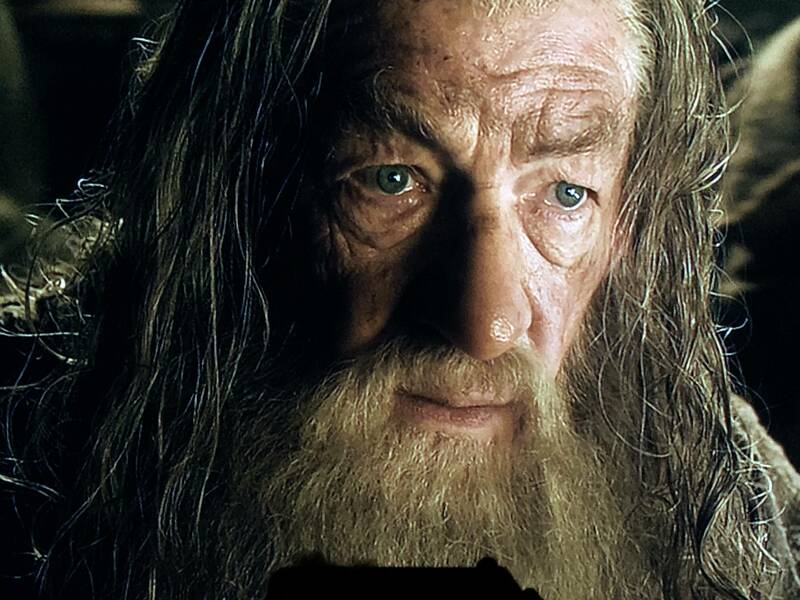 Granted there are movies that dont look as sharp or not as bright as you would want it but that really comes from the content. I used bladerunner 2049 as my reference movie. Knowing that the movie looks good the rest should look as good or its just how the movie looks like. Christine being an old movie looked awesome and newer movies such as ready player one where just jaw dropping. On the other hand movies like Mission Impossible Fall out or the Last Jedi dont look so great because of the color filter that ws added but hey thats directors intent. I get my 5050UB after work tonight. I am so pumped. I will also be getting the Panasonic UB820 st the same time. Will post impressions and screen shots when I can. Curious if you can get the 1.01 firmware update installed. I had no luck with it. LOL I hear that. Enjoy! Last edited by FendersRule; 04-16-2019 at 02:23 PM. Can anyone confirm if the 5050UB can fully support the PS4 Pro without the use of a linker? 4K HDR gaming via PS4 Pro could not be supported with the 5040UB without a linker. I was just hoping this one does not require it. Which is why I asked my brother for his opinion, corrective laser surgery has given him 20/15 vision. The sku is 6344895. It isn't on bestbuy.com yet. I had to go into my local store and had to have someone search through their systems to find it. Then they ordered it and set it up for pickup for me because it was the faster way to get it.